This article appeared as an introduction to the breast biopsy systems comparison chart. When breast imaging studies cast suspicion that there may be cancer present, a common course of action is to obtain a tissue sample in order to make an accurate assessment. Today, while there are several minimally invasive biopsy techniques available, a more invasive surgical procedure is being used more often than it should be - at least in the state of Florida and perhaps across the country. That is the conclusion of a new study conducted by University of Florida (UF) researchers and reported in various media outlets in February. The researchers analyzed public health data for the years 2003 to 2008 and found that about 30 percent of the breast biopsies conducted were performed through open surgery. General guidelines say they should account for only 10 percent of biopsy procedures. "This is an important message and should be generalizable to other parts of the country, in terms of the desirability of using minimally invasive biopsy techniques," he said. Similar sentiments were shared by other doctors in various news reports on the study. The article noted that in Florida alone, the study indicates more than 300,000 women each year are having surgeries they don't need, with associated healthcare costs of $37.2 million. A Bloomberg report 3 on the study noted about 1.6 million breast biopsies are performed nationally each year. It quoted another study author, Stephen Grobmyer, M.D., medical director of the UF breast center, saying, "This may suggest that more education is needed for both doctors and patients. An opportunity to cut costs and make things better for patients is being missed." • Fine needle aspiration (FNA) - A surgeon or radiologist uses a thin needle with a hollow center to remove a cell sample from a suspicious area. • Core needle biopsy - This method involves a larger hollow needle than FNA, which is used by a surgeon or radiologist to remove several cylinder-shaped, solid samples of tissue. This involves several insertions of the needle. If a lesion is not palpable, a surgeon or radiologist doing either an FNA or core needle biopsy can use an image-guided technique, such as ultrasound, stereotactic mammography, positron emission mammography (PEM), magnetic resonance imaging (MRI) or breast-specific gamma imaging (BSGI), for accurate positioning. • Vacuum-assisted breast biopsy - This technique requires only one insertion of a special probe that has a rotating cutting device, which removes a tissue sample. The probe can be rotated multiple times to take multiple samples. This technique also is performed by a surgeon or radiologist and requires image guidance. There continue to be ongoing developments in breast biopsy systems. 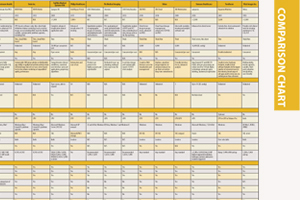 Specifications for some of the systems currently on the market are featured in the comparison chart on the following pages.